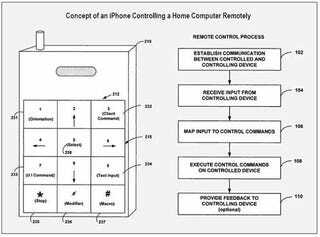 A newly unearthed Apple patent application describes a process in which an iPhone could control a MacBook or iMac, remotely. Essentially, the iPhone establishes a connection with the computer, then it can control the OS in a similar manner to a TV remote. Using a virtual d-pad, users navigate through apps, open them remotely and even print. But what's possibly more promising that buttoning around an OS is that voice commands could be deployed to skip many of these navigational hassles.